Are you an Early Childhood Teacher or Home School Parent? Perhaps you would like a comprehensive year-long apprenticeship including a week of residential training each season. Or you may simply need a mentor at the other end of the phone line to listen and help with your classroom questions. And you may need something in-between. Programs are individually designed between the student and Sharifa. Together we will look at your goals, your main interests and questions, your time availability, and your budget to create a learning experience that offers what you want most. Join me for Acorn Hill’s 50th Anniversary! I am so happy to invite you to join me for the Foundations of Healthy Brain Development Workshop at Acorn Hill this coming weekend! Acorn Hill Children’s Center was instrumental in my years of training and has always been a beacon of light for many teachers in our work with small children. “The school day doesn’t just stop when the day is over. Greer plays school whenever she is at home as well. At home she gets the chance to be the teacher. She sets up our living room like the living room at The Rose Garden. Moving the coffee table and couches so that the space is just right. She brings in her own chair along with a cup of tea and some crackers. She sets her babies up in a semi circle around her so everyone can see and then she begins to “read” her story always starting with the chime of the bell which at our house is the clinging of silverware. She then sips on her tea as she tells her story with a big (all words) book in her lap. When the time for resting comes up she prepares by laying all the colored silkies around the room and placing each baby it the appropriate place. She covers them says sweet words to them and gives each a gentle rocking motion to help the fall asleep. Once everyone is satisfied she goes to her chair and has a sip of tea. Watching this take place in my own living room gives me a sense of satisfaction and pure joy. What my husband and I are giving our youngest of three is a treasure that is molding her into the gentle and kind human-being that we had hoped for when we decided to become parents. And thank you, Shannon, for sharing this with us! These rhythms create the foundation for a lifetime. During the summer, I had the pleasure of talking, on separate occasions, with two of my former students who are now college students. Each young woman told me how deeply her early years had formed and shaped her. 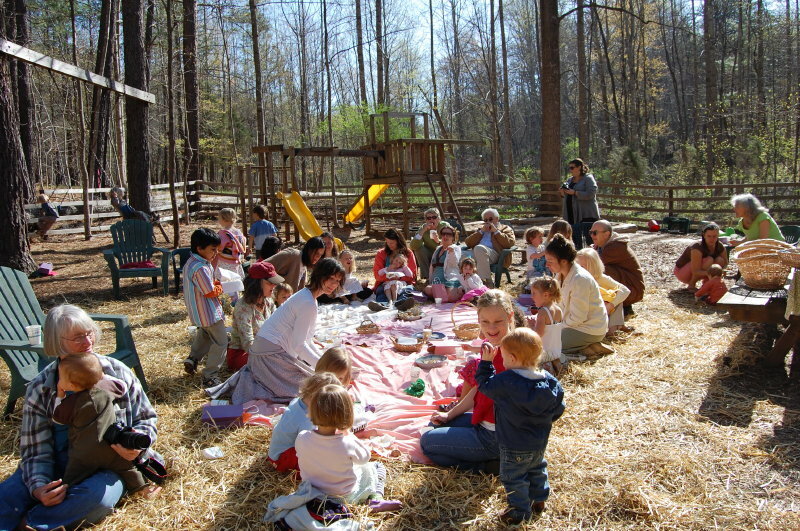 The years spent in this forest busily building “homes” for insects & feeding the birds as well as singing, painting, playing and listening intently to stories had given them a deep love for the world, and also a beginning direction in their future work. One young woman is studying environmental law and she said she paints for pleasure, while the other is a poet as well as environmental activist. In agricultural societies, winter is the time to think-through and plan for the future. Decisions regarding which crops to continue, which fields to allow to remain fallow, and new seeds to experiment with are at the forefront of farmer’s minds. Today, as I watch the snowfall just outside my window, I also am thinking of seeds for the future. I am pleased to invite you to join me and others who contemplate our best future, to the March 4 -6, 2011 conference Re-Thinking Childhood: Parenting and Educating Children in a Time of Global Transformation hosted by Great Lakes Teacher Training, Milwaukee, WI. It is our consciousness, knowing who we are, that shapes our children and the future as well. Raising and educating our children to know themselves prepares them best for whatever the future may hold. For it is in knowing ourselves, that we hold the compass which guides our actions. When we know who we are, we will know what to do. Virginia has had a very cold winter so far: many, many days the temperature is below freezing, and plenty of days in the 20’s. 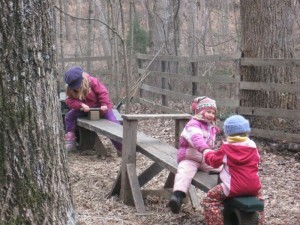 This has not phased The Rose Garden children, as we play in the woods! As Helle Heckman says: “There is no such thing as bad weather, there is only bad clothing!” Equipped with woolie long johns, plenty of layers, snow suits even with no snow, and snug hats and mittens, the children have flourished in the cold. “But why,” you ask, “send them out in such weather?” It is hard to convey the importance of Nature, in the development of young children. 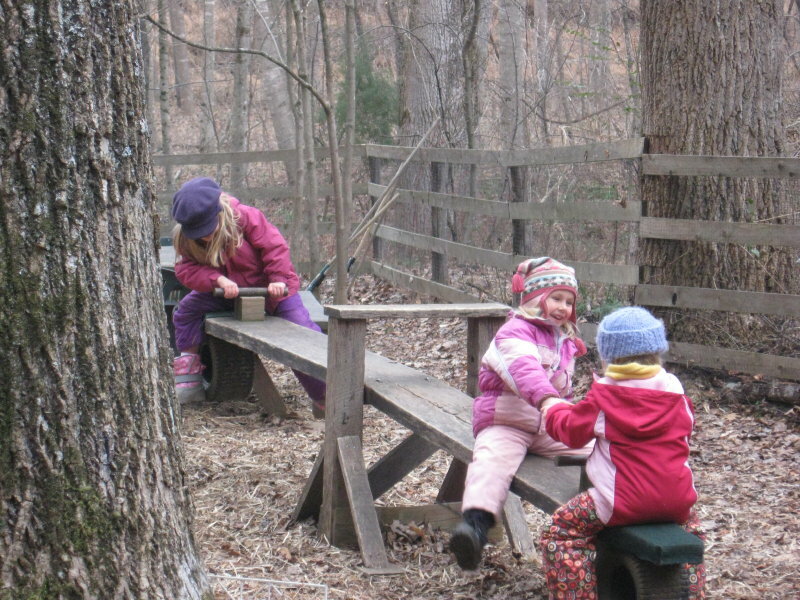 “Much research has been done, observing children’s play in both natural spaces, and in “built spaces” Studies show that children engage in more creative play in green areas than in built spaces. One study observed children playing in both “vegetative rooms”, (little forts and such that he children had built themselves) and in playgrounds dominated by play structures. 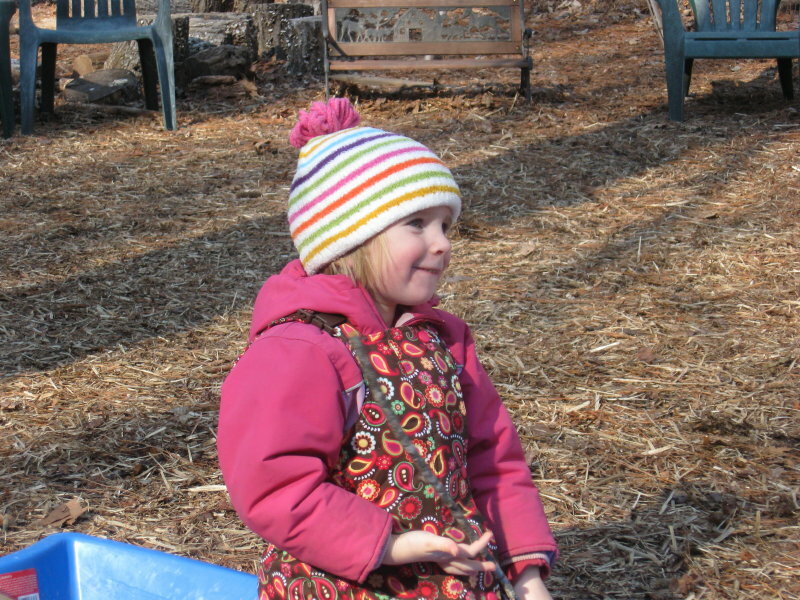 They observed that children playing on the formal play structures grouped themselves in hierarchical subsets, dependent upon physical abilities. Whereas the children playing in the natural vegetative rooms used more fantasy play and their social standing was based more on language skills, creativity and inventiveness”. Language skills, creativity and inventiveness abound when children are given plenty of creative play time; time to run and frolic held in the arms of our Mother, the Earth! The Lantern Walk is Coming! Autumn is a time to turn around and survey the work of the year. A time to assess what has developed, before we make plans for what is to come. In doing this, I looked back to my first post on this blog, and here is what I found. At the exact moment we begin preparing for the Lantern Walk this year! “All week long the children had been watching Rebecca and me make paper lanterns of their watercolor paintings, folding and cutting the stars so perfectly, gluing and stapling, attaching the wire handles, filling each one with a candle. Such anticipation….the Lantern Walk! Finally in the gathering dark, each little lantern was lit, their cut out stars shone bravely and the warmth of their red and gold glow gave us good cheer as we walked the woodland path. 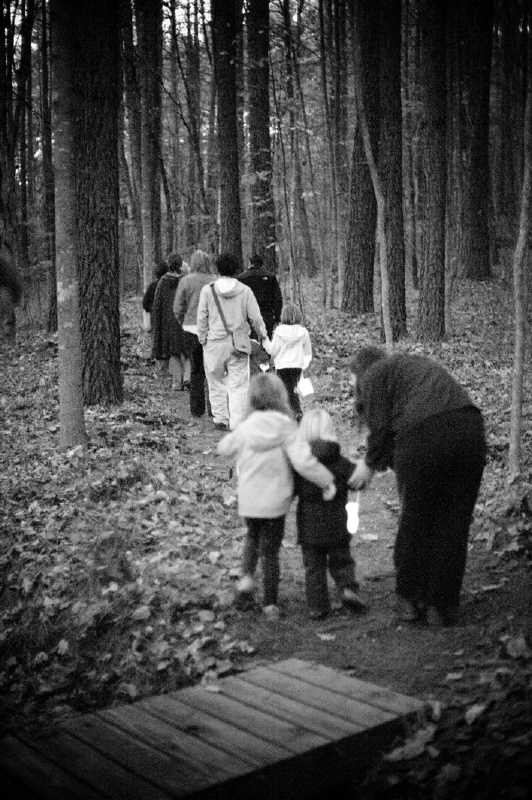 Rustling through the fallen leaves, singing through the woods, happily we trudged up and ever up the forested hillside. Round we looped, until at my long driveway’s end, the children had a thrill: if their parents agreed, they might hand the lantern to the adult, then run like the wind through the dark, all the way to the playground gate! We live in the great round of the year, and the celebration of festivals lives deeply in our roots. Across all cultures and ages, humans have come together in observance of the progression of time, in recognition of our relationship to the earth. Although our western society has become far removed from these agricultural origins, we can give recognition to the way these rhythms still live in us through the celebration of family festivals. We can rejoice in the turning of the seasons at home with images, stories, foods and activities that evoke seasonal qualities. Many of the agricultural festivals and their closely associated religious holidays have been claimed by marketing agencies and have become overly commercial, devoid of soul. If we choose, though, we can ensoul them and make them our own unique celebrations. They can become a picture of our life together. In the celebration of a festival, we take a moment outside of the inexorable progression of time. We stop time, so to speak. In this way we can assess where we are right now. We can look back over the last year, remembering where we were, what we did, and who was present this time last year. We can pause to glance over what the year has brought, how we have changed and grown, as individuals and as a family. We can also cast our glance into the future, looking to see how we will change in the coming year and what will be needed at that time. In the Festival, we step into Eternity…come celebrate! 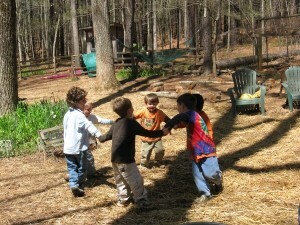 Our children, and indeed children everywhere, break into spontaneous circle games. Their small bodies, psyches, and souls reflect great cosmic circles. 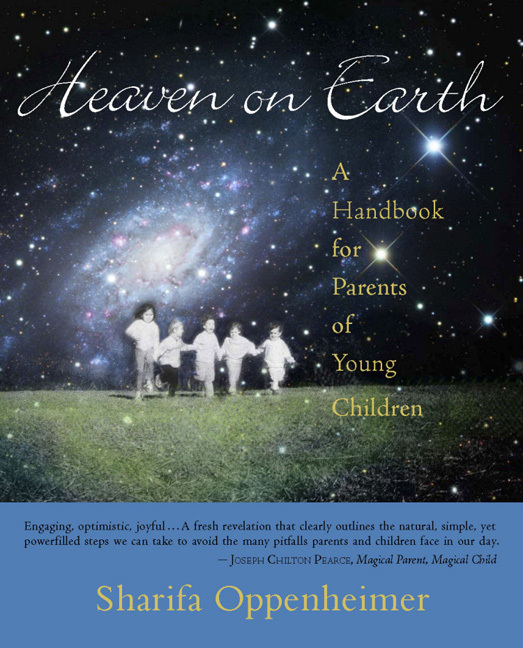 In our childrens’ joyous, dizzying games we can see intimations of the whirling bodies, vapors and colors sent back to us from Hubble’s photographs. Soon we will pass through one of these nodal points, the Winter Solstice, and Light will be born again. Not only in Springtime, but now deep in the winter, new beginnings stir. Perhaps your family has managed to escape the crush of commercialism, and you are preparing for a simple and cherished holiday time together. It is at these festival gatherings that we have the opportunity to “step outside of time” to review the year we have just completed, as well as envision the year to come. Take a moment at the holiday meal, to recollect together high points of your year, and also look together toward the growth the coming year will bring. As we engage in this recounting of our family’s story, and creatively imagining our future, we build up an oral history. This Living Book of Life will nourish our children, as well as model for them how we create, through images, the life we want to live. Our year here at The Rose Garden has been full. Family Camp was magical last summer, and our circle of friends has widened. The garden has grown and the children have too. Some of them have stepped into new adventures in Grade School, and have returned to visit us, shining with new capacities and knowledge. New families have joined us, and new friendships bloom. New Land has graced us! Looking toward the future, here is an idea I want to share with you. Let’s use this blog as one forum for your parenting questions. (Check the Family Consultation page for other ways to address your questions, too.) It seems the downturn in the economy has brought into vogue the parenting values we have always held dear. 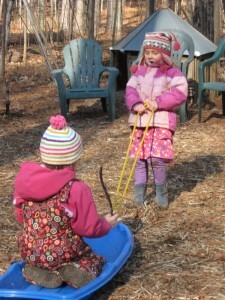 Now you read about “free-range parenting”, or “slow parenting”. 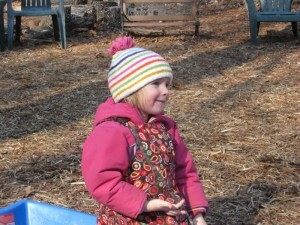 The Rose Garden’s description has always been “A Slow Meander Through Early Childhood.” Email me your questions, observations, thoughts, concerns, and I will be happy to share ideas with you. Your questions, most certainly, are mirrored in many other parents, and we can look at these together. Together we can explore the particulars of your own child’s slow meander.